This is a demo shown in NIDays 2009 China which was held in Shanghai, China. EMG (Electromyography) is similar to ECG which is very important in biosignal analysis. Surface EMG acquisition is also similar to ECG acquisition. We could use several electrodes attached on our skin and acquire the voltage changes using NI DAQ cards. 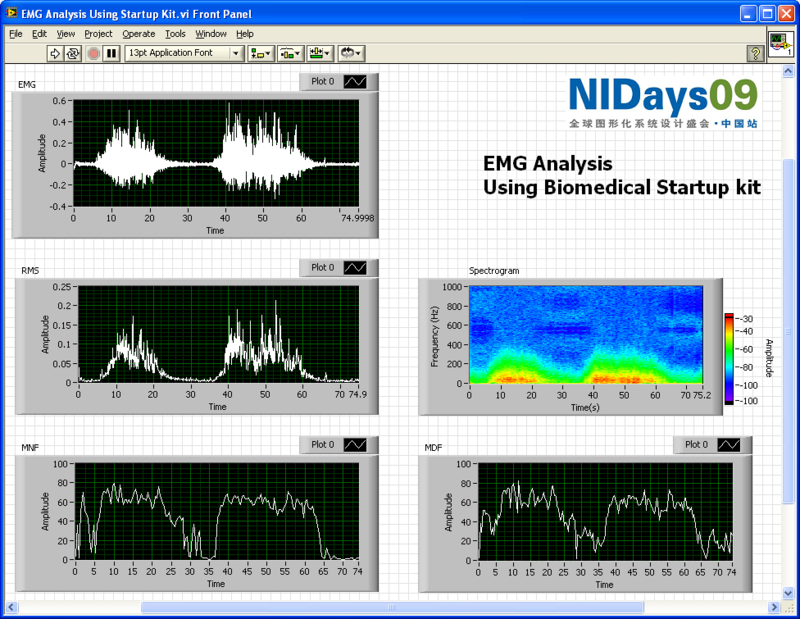 The attached is a demo VI using NI Biomedical Startup Kit Source Code version to analyze the EMG signal including RMS, Spectrogram, Median Power Frequency, Mean Power Frequency. Requirement: You need to install NI Biomedical Startup Kit Source Code version. I can't seem to get this VI to load properly. Is this VI compatible with the newest version of the Biomedical Startup Kit? Thanks for the advice. I tried to run 'emg analysis startup kit' example in labview 9 and labview 7 but failed to find some tools or VI like "emg_median power frequency","emg_mean power frequency" etc. I m not sure if these VI are inbuilt or user defined. please help me out in getting this example run properly. I tried to run 'emg analysis startup kit' example in labview 9 too. It failed to find some tools or VI like "emg_median power frequency","emg_mean power frequency" etc. how can i understand the block diagram ?? 1. Load EMG sample data by using Biosignal Import (block by block) VI. 2. Remove DC component by subtracting mean value from EMG signal. 3. Calculate the average RMS(root mean square) of EMG signal by using emg_Average RMS VI. 4. Compute and display STFT spectrogram. 5. Calculate the mean power frequency and median power frequency of EMG signal by using emg_Mean Power Frequency VI and emg_Median Power Frequency VI. If you have installed Biomedical Toolkit, you could use Simulate ECG Express VI to simulate one surface EMG signal.